I hope I have a decent record of not pushing Kickstarter Projects unless they seem to be a good deal for my 12 regular readers here. 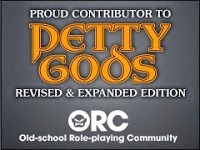 The creator of the Small Dungeon Maps, Jean Francois Senay, has another Kickstarter that looks like it'll be even better than the last one. 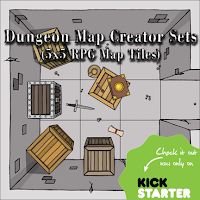 Dungeon Map Creator is a collection of 9 sets of 32 5x5 map tiles. As of the writing of this post not all of the sets have example images yet, which I'd normally be quite concerned with. Fortunately Jean Francois Senay already has a great track record with fulfillment and the fact he set such a small funding goal tells me he was always planning on doing all nine sets. These tiles are pretty much a top-down perspective so they aren't as awesome as the earlier sets for a VTT, they will have a lot more use for all GMs.